Renault UK has confirmed its intention to run a race series for the new 5-door Clio Renaultsport 200 Turbo with EDC dual clutch transmission in the 2014 season. As the current UK championship concludes at Brands Hatch on 20th/21st October, work is underway behind the scenes to ensure a smooth transition to the brand new 100PS 1.6 turbo-powered car which will debut in Europe next year. During initial testing, so far amounting to 3,500 kilometres at a variety of French circuits, lap times have been roughly one second per lap quicker than the existing normally-aspirated 2.0-litre Clio Cup car. Featuring a 1.6-litre turbo-powered engine tuned by Oreca Magny-Cours and sealed at source, developing 220hp and 270Nm of torque, the new Clio Cup racer has a six-speed sequential gearbox (not the standard EDC) with an AP Racing clutch and limited slip differential. There is also the option of a paddle-shift change. High performance braking is guaranteed with 320mm AP Racing front discs and four-piston callipers, while the suspension features one-way adjustable dampers from ZF-Sachs with specific aluminium wishbones. Electronically, the complete data acquisition system is integrated into the TFT full colour dash display. Aerodynamically the car boasts a highly efficient rear wing, offering 40kg of downforce at 125mph, with the addition of a roof scoop similar to the one on the current Clio Cup. Enhanced safety features are, of course, a pre-requisite while the car sits on 17-inch Speedline Corse racing alloys. “We’ve enjoyed 22 fantastic years of Renault UK Clio Cup racing and the brand new Clio Cup race car is an incredibly exciting new chapter in the story for everyone”, said Renault UK Communications Director Jeremy Townsend. Since first bursting onto the national motorsport scene in 1991, as a replacement for the Renault 5 series, the Renault UK Clio Cup has been a cornerstone of British circuit racing and has played a key role in the careers of some of the sport’s most successful touring car and sportscar drivers. The previous generation Clio Cup was introduced in 2006 and has been highly successful with over 700 race cars sold. Several graduates from Clio Cup currently form part of the current British Touring Car Championship grid, including 2006 champion Tom Onslow-Cole and 2010 title winner Dave Newsham. Jonathan Adam, the 2005 champion, is a race-winning force in the British GT Championship and also competed successfully in the BTCC prior to his switch to sportscars. 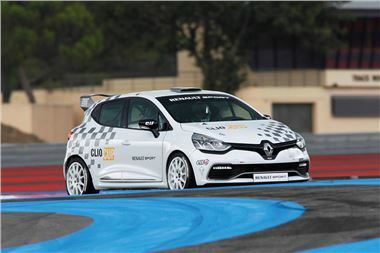 The new Clio Cup racer will be available for delivery in the UK from September 2013 priced from €37,800 excluding VAT.